Start with clean dry hair. If your hair isn’t perfectly clean, give it a little shot of dry shampoo! You can do a side part or a center part– which ever you feel is more flattering to your face shape. Make a diagonal section starting at your part and going down in front of your ear. and here. Now clip the hair from the front section up and save that for later. Give the hair a nice tease on top in your “crown area”. Smooth over the teased hair using the finer side of the comb so it doesn’t appear too ratty. At this point you can give the top a little spray if you want to! You can use a tail comb to pull it back up. As long as there’s teased hair under there, you can get that volume back. Next we take out the front section. 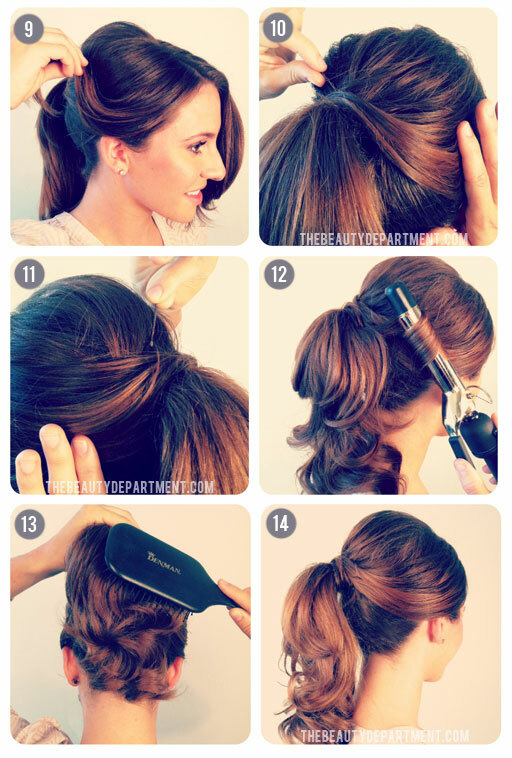 Take one side and drape it over the ponytail holder. Use a little spray to hold it in place if you need to. Use small bobby pins to secure the pieces you’re wrapping around the ponytail holder. Repeat the same thing on the other side. If hair falls out of this section or doesn’t reach, you can just let it fall and/or tuck it behind your ear. Curl all of the hair in the ponytail. I like to curl everything in the same direction on each side so that you get a pattern going, but you can definitely make a more messy curl if you’d rather. It’s completely up to you whether you brush the ponytail curls out or not. I personally like t0 brush them because the ponytail gets fuller and more bouncy. Check the back using a hand mirror and make sure it looks balanced. Give it a final veil of strong holding hairspray.